In this brave new NHS-free world that will be soon be mine there will be time to learn new things and I'm taking a very careful look at the vast array of non-fiction available on my shelves. This might all take a while to shape into any sort of pattern, currently all a bit disconnected in fact and I'm finding there is great pleasure in just picking up a book on any subject and reading it. Apropos of no connection whatsoever to anything else I'm reading, I opened Pompeii, The Life of a Roman Town by Mary Beard and published by Profile and couldn't close it again...and it wasn't just the pictures. My introduction to Mary Beard came at Dartington Ways With Words and The Grand Literary Balloon Debate where I asked that terribly awkward question of Andrew Davies. Mary Beard valiantly flew the flag for Homer and listening to her impassioned pleadings on his (or her?) behalf I sensed here might be a Classicist with a difference, touch of the subversive and the irreverant about Mary Beard that I thought could just all make the Classics slightly more palatable for the likes of me. I was therefore delighted when Pompeii arrived and a quick flick through those pictures confirmed that Mary was going to spare no blushes in her quest for veracity and realism. On the subject of the pictures and the Pompeian male anatomy, may I say that if you think your junk mail contains extravagent claims for enlargement, nothing measures up to the exaggeration-prone (presumably) Pompeians. 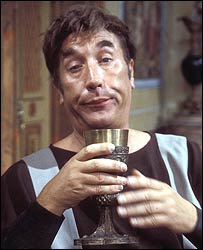 So I settled down to read just what might have gone on in 79 CE bearing in mind and with apologies to the Latin Teacher (mine, yes really, found me via this blog, will be reading this) that the extent of my knowledge of Pompeii is mostly Frankie Howerd-based. But CE? Is that AD or BC or something else entirely? Am I being dense? Who moved those goalposts without telling me? Can someone explain? Pompeii it transpires has been the victim of manifold insults, not just the eruption of Vesuvius and not all entirely ancient in origin. There was an earthquake seventeen years before the 'pyroclastic surge' and it's difficult to know what residual damage remained as the pumice flowed, but almost as damaging perhaps the 'aggressive restoration' in 1909, quickly followed by another earthquake and then, as if things could get any worse, substantial bombing of the site in World War II along with the loss of precious research documents held at Dresden in Germany. 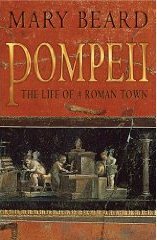 What remains, apart from the buildings and the artefacts, is a collection of who knows what really because a great deal of conjecture and misinformation seems to surround Pompeii; interpretation is all it would seem. Did the Pompeians really get caught on the hop and die in their tens of thousands as their brains boiled? Did they really eat dormice dipped in honey? Were there really two hundred brothels? Enter Mary Beard to sift capably through the ruins on our behalf bringing an evidence-based and scholarly yet highly readable account of life in Pompeii in 79 CE. Just as I was thinking what a great sense of immediacy this book had, Mary Beard thought the same about the streets of Pompeii and reading her book is like taking a turn around the Forum with someone who knows truth from fable, sorts out the sensational and dismisses it, dispels the myths and gets down to the nitty-gritty of things like Pompeian halitosis...it must have been shockingly bad apparently judging by the calculus discovered on the teeth. Likewise forget all that sponges on sticks instead of Andrex stuff and no, they didn't all have breakfast reclining on the triclinium ( a sort of three-way Ikea sofa affair) or wear togas all day either. There is of course plenty of serious research too into the lives, politics,religions, homes and yes, what they did in their leisure time and Mary Beard explains it all with unflagging interest and a fine sense of humour. Location, location location would seem to be as important then as now; don't live within earshot of the baths for instance, or expect to have to contend with the yells and screeches as people had their armpits plucked and then moved on for some Romanesque exfoliation in the 'scraping down' room.This could be a useful maxim to remember next time you move house, for goodness' sake do your research. In fact don't even go to the baths unless you want to pick up some gargantuan infection, the baths were a veritable bacterial cesspit, just imagine the wound sepsis? I suspect pseudomonas aeruginosa had its origins here, be interesting to know if there were any reports of turquoise suppurating wounds (well interesting to me anyway). Meanwhile now I'm quite taken with the ancients so I think my next non-fiction foray will be to Stonehenge with Rosemary Hill. So what exactly was that all about then?